Happy Is In! - Peter Levitan & Co. Happy Sure Looks Like Its In! I just had a nice United Airlines person help me out with a seat change for a flight from SFO to San Antonio. She said, “I just want you to be happy.” Sweet. Made me think of Pharrell Williams and his “Happy” video that has been viewed… get this: 580,977,836 times on Youtube. 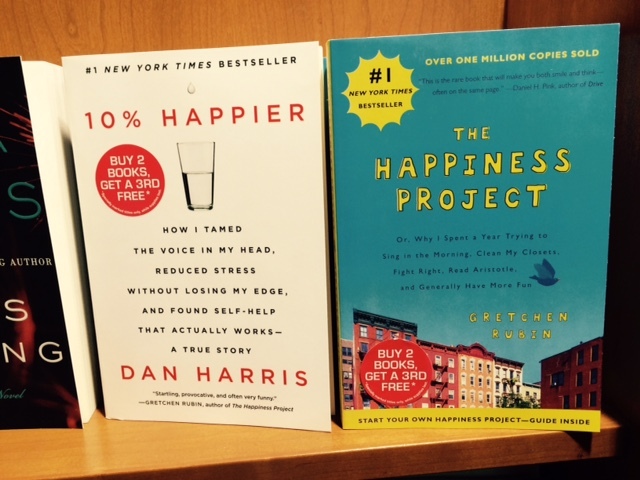 After my happy United moment, I walked down the hall at the airport and saw a book display with these two books on the very top shelf. Guess they are selling. And, given the demographics at the airport — selling to the business market. So, what’s going on? Is there a rush to Happy? Does ‘Happy” sell? Apparently. Are any advertising, design, social, etc. agencies mining this trend? Having smiles be an objective of social media campaigns. In the mobile experience where the phone is sure near the smile muscles. Thinking really hard about how to make your clients happy. Keeping staff because they are happy. This entry was posted in Marketing and tagged advertising, marketing, social media. Bookmark the permalink. Trackbacks are closed, but you can post a comment.